Simone has been teaching printmaking since 2009, as well as organising exhibitions and print events. In that time she has pulled together over 20 exhibitions and print events, and taught countless adults, teachers and teenagers. "Simone Tippett is an experienced and passionate printmaker and facilitator. Her hands on workshop at the Art Gallery of South Australia provided educators with simple techniques and strategies which helped teachers incorporate printmaking activities in their classrooms with ease. Simone demonstrated a variety of methods using materials that are inexpensive, safe and readily available for primary and secondary classrooms." so much happier when she has art. and keep doing what you do! "Not that she’d say it, but all roads lead to Simone if you want to have fun printmaking." "Simone Tippett is a proven leader and fabulous role model for those working in the printmaking community. She is also an inspiring educator who embraces everyone regardless of their background, influence and level of expertise. I look forward to a long and positive working partnership with her." "Simone has the wonderful ability of bringing people together, especially within the printmaking community. She has created an environment that is fun, welcoming and inclusive for anybody wishing to try their hand at a multitude of printmaking techniques and 'get inky'! Simone is a highly regarded and much loved powerhouse of the art community and I'm grateful for the opportunity to have worked with her on many occasions." 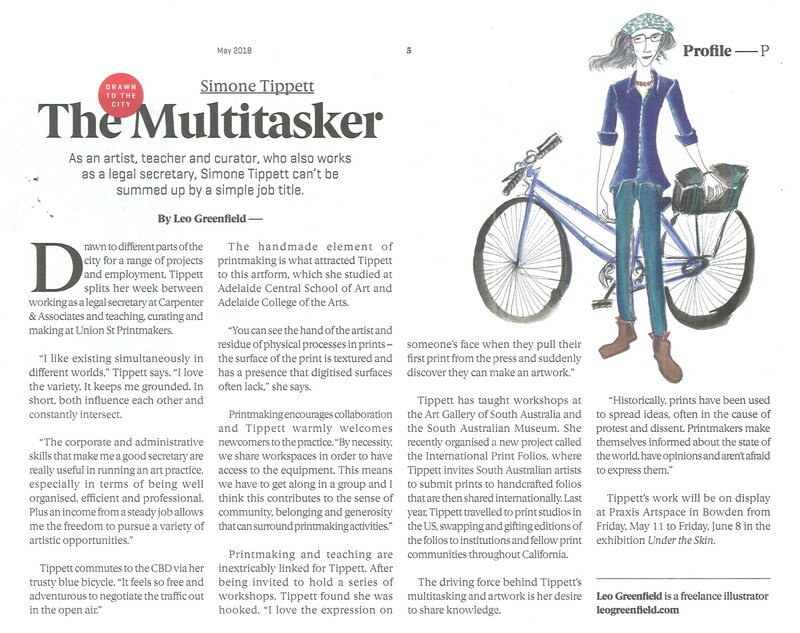 "Simone Tippett is one of the most organised and enthusiastic people in the Adelaide art scene! Her selfless contribution to the printmaking community in South Australia (and beyond) is truly recognised by many. She is also an extremely friendly and approachable person to work with!" "Simone is a brilliant teacher! Enthusiastic, flexible and dedicated to providing a platform where artists can learn, share and exhibit with confidence. I thoroughly recommend her to anyone wanting to expand on their printmaking experience." "We appointed Simone to be the Enjay contact in SA in 2015. Deeply knowledgeable in printmaking and committed to promoting printmaking in SA, Simone is highly reliable and great fun to work with." "Before I met Simone, I was a regular reader of her fantastic newsletter. It is so important to have a comprehensive summary of what’s going on in the printmaking world, particularly for a regional printer like me who lives 5 hours from a capital city. I recently attended a workshop at the new space in Hindmarsh and I have to say that Simone’s enthusiasm, organization down to the smallest detail, friendliness, encouragement and printmaking knowledge was a huge inspiration. Simone welcomed me into the ‘Adelaide printmakers’ group as if I was one of them already! I have come home with a new enthusiasm, new friends and more confidence in my ability to achieve great things with my printmaking. Thank you Simone." "In the space of less than a decade, Simone has united, galvanised and inspired printmakers all over Adelaide with unflagging energy, dazzling efficiency and infectious enthusiasm. Thanks to her comprehensive newsletter, we now know when and where to go for workshops and print-related exhibitions; through Union St Printmakers, beginners and experienced printmakers alike have been able to improve their skills, exhibit their work, take part in an international print exchange and attend workshops with printmakers from interstate - and above all, connect with each other in a friendly, relaxed studio environment. She is definitely one of South Australia's Treasures." "Simone is an enthusiastic advocate for printmaking in this state. Her support for artists working with print media extends across many platforms. She has earned a high reputation for the printmaking workshops she has presented. More recently she has embarked on a more ambitious undertaking by establishing a large workshop facility at Hindmarsh that includes specialist equipment for artists working with letterpress. "Simone has organized many successful print exchanges, curated print exhibitions, managed a very popular workshop facility, represented printmakers on a national level, and compiles an invaluable comprehensive newsletter that has become essential reading for anyone concerned with printmaking. Her infectious optimism and willingness to take on new challenges in the world of printmaking has been inspirational for anyone who has worked with her." - Geoff Gibbons, printmaker & Chairperson of Bittondi Printmakers Association Inc.